The grocery firm Loblaws is issuing an apology to Campbell River for an incident that resulted in a portion of the Inland Island Highway being closed down for close to 15 hours. A semi-trailer filled with groceries overturned along Highway 19 just after 2 a.m. Friday, blocking one of the northbound lanes. It took crews several hours to deal with spilled fluids and transfer groceries out of the trailer so it could be righted. 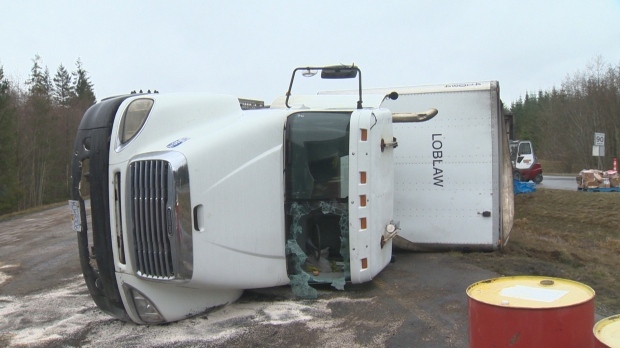 Karen Gumbs, Director of Public Relations for Loblaw Companies Limited, confirms a driver lost control of one of their trailers and it flipped onto its side resulting in the highway being blocked. "We apologize to the residents of Campbell River for the inconvenience this caused," Gumbs said. Main Road North Island Contracting Supervisor Damian Girard says his crews were notified of the crash around 2:15 a.m. Friday and said the driver was not injured and exited the truck’s cab by smashing out the front windshield. Crews from Coastline Towing spent several hours transferring groceries out of the trailer into two other trucks so the rig could be righted. Coastline owner Tom Caflisch said the load contained everything from, "A-Z from ketchup to water... when we’re unloading it, we ensure that anything that is damaged we put to the side so we consider that contaminated and that anything that’s unbroken and clean and in 100% good condition we’ll repalletize it". 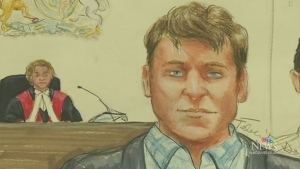 Gumbs said Loblaws staff are currently inspecting the contents and "based on our food safety protocols we will determine if the food is suitable for sale, donation or disposal."